Eco Green Energy Group Limited (EGE) is a leading Chinese manufacturer and distributor in poly and mono PV modules and solar system solutions. Established in 2008, our factory and offices are located in Nantong, Jiangsu. We design and develop our modules before exporting them all over the world. (South America, Asia, Europe etc...). We are able to offer a wide range of solar modules from 10 to 350 Watts thanks to our factory organization which allows us to remain flexible in terms of production process and in terms of cost management. Furthermore, our production lines are automatized with state of the art machinery and equipment. 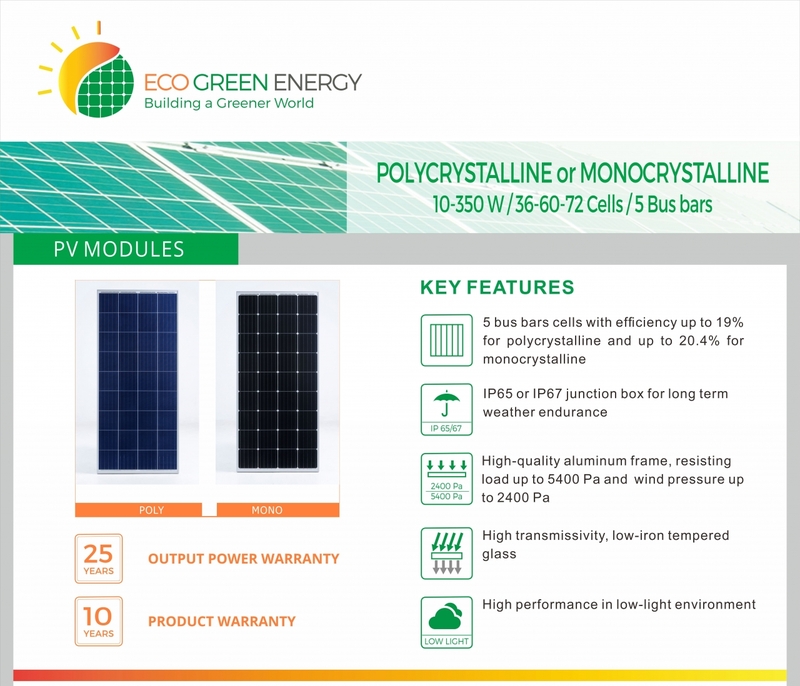 That is how we produce cost effective and reliable modules using 4 or 5 bus bars cells made of polycrystalline and monocrystalline silicon. 100% of our modules are tested and certified to ensure the best safety and security standards as well as the highest quality possible (IEC 61 730, IEC 61 215 certifications, among all). Thanks to our requirements in terms of quality control (EL test, flash test), we can ensure a lifespan of 25 years and provide a 10 years product warranty, with a guarantee of high performance even in harsh environment and low-light conditions. Our mission is to supply complete solar system solutions and help you to success in your projects. Our first priority is to provide personalized services and strong support assistance. We also offer the possibility to customize panels and products according to your own needs and requirements (OEM services; materials, dimensions). In order to build trustful relationships, we also systematically provide QC reports and certificates proofs. With our ten years’ experience, we are able to work on various projects: retailing activities, governmental projects, tenders etc. Our international team composed of foreign native speakers will follow you in your projects and provide you with the best expertise in the solar field/area. 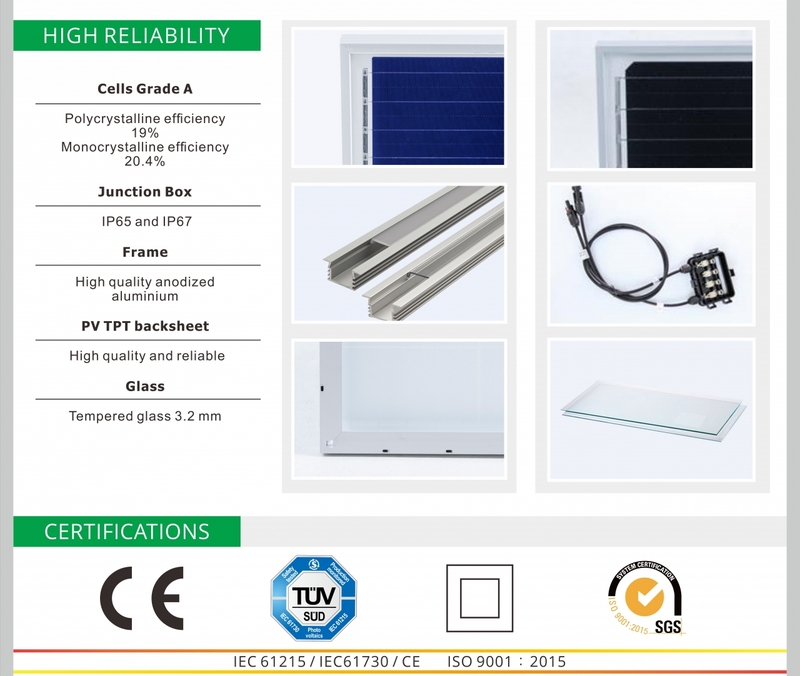 Eco Green Energy produces a wide range of solar panels, from 10W to 340W, using 4 or 5 bus bars cells made of polycrystalline and monocrystalline silicon. Our cells efficiency goes up to 20.4% and our modules efficiency has a maximum efficiency of 17.52%. 100% of our modules are tested and certified to ensure the best safety and security standards as well as the highest quality to our customers. They are certified in compliance with the IEC 61 730 and 61 215 norms, which are the most important references in quality certification. In addition, the junction box is built for long term weather endurance with IP67. Therefore, our modules can be used for various applications ranging from several megawatts to modules for private individuals, with a guarantee of high performance even in harsh environment and low-light conditions. 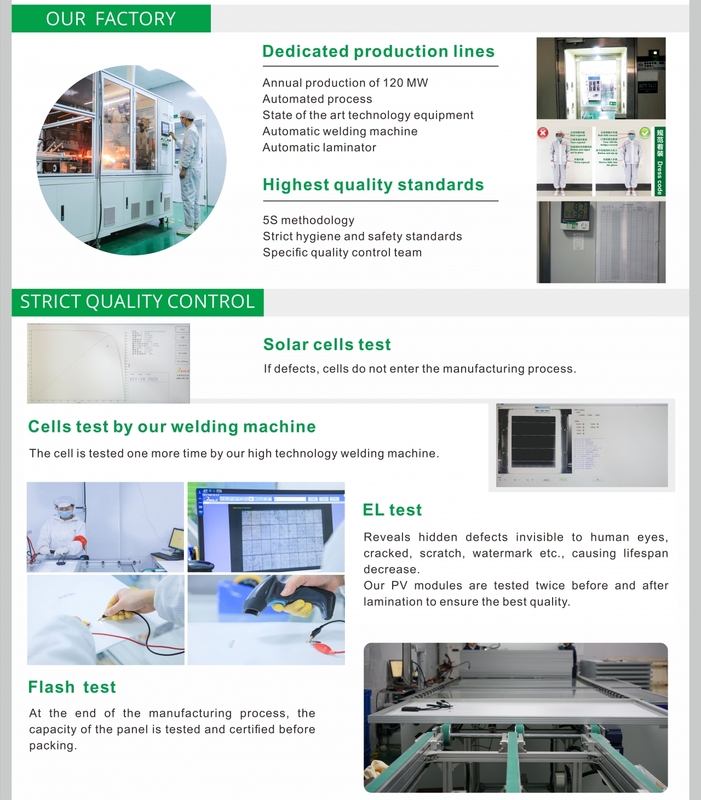 Thanks to our requirements in terms of quality control (EL test, flash test), we can ensure a lifespan of 25 years and provide a 10 years product warranty. In order to build trustful relationships, we also systematically provide QC report and certificates proofs.